Materials for hand-made crochet flower brooches. This pretty flower is worked all in one color. It is crocheted in the round starting in the center and working outward from there. This is an easy crochet project that works up quickly. Skill Level: very easy/advanced beginner. You'll need to have learned (and practiced) these basic stitches: the chain stitch, single crochet, double crochet, and slip stitch. Yarn or Crochet Thread: You can use just about any size fiber to make this project. We used Cascade 220, which is a medium-weight yarn, to crochet my sample flower. Crochet Hook Size: To crochet the sample flower, we used a size I crochet hook. However, this hook size is not set in stone; you'll need to choose a hook that's compatible with the yarn or crochet thread you'll use for crocheting your flower. Our sample flower measures about 3 3/4 inches in diameter. Flower sizes will vary based on supplies used and other factors. Ch 5. Join the end of the chain to the beg by working a slip stitch to form a ring. Round 2: Work 2 sc into each sc all the way around. You'll end up with a total of 24 sc sts. Sl st to join the work to the 1st sc worked in the round. Round 3: [sl st in next sc, 1 sc in ea of next 2 sc, sl st in next sc.] Work sequence in brackets 5 more times. You'll end up with a total of 12 sc sts in the round. Round 4: [sl st in next sl st, sl st in next sc, ch 3, 2 dc in next sc, ch 3, sl st in next sl st.] Work sequence in brackets 5 more times for a total of 6. Round 5: [sl st in next sl st. Skip next sl st. Work 3 sc sts into the space formed underneath of the ch-3 in the previous round. Work 1 sc in ea of the next 2 dc. Work 3 sc into space formed under the ch-3. Skip next sl st.] Repeat sequence in brackets 5 more times, for a total of 6 times. At end of the round, sl st to join the work to the 1st sc st worked at the beg of the round. End off. Weave in the loose ends. If you crocheted your flower using thread or yarn that responds well to blocking, i.e. cotton or wool, feel free to block it if you wish. If you used synthetic yarn such as acrylic, there is no urgent need for blocking, although you could steam it a bit if you like. My sample flower has not been blocked, but it should be. What Can You Do With This Flower? Attach it to a hat, headband or ear warmer. 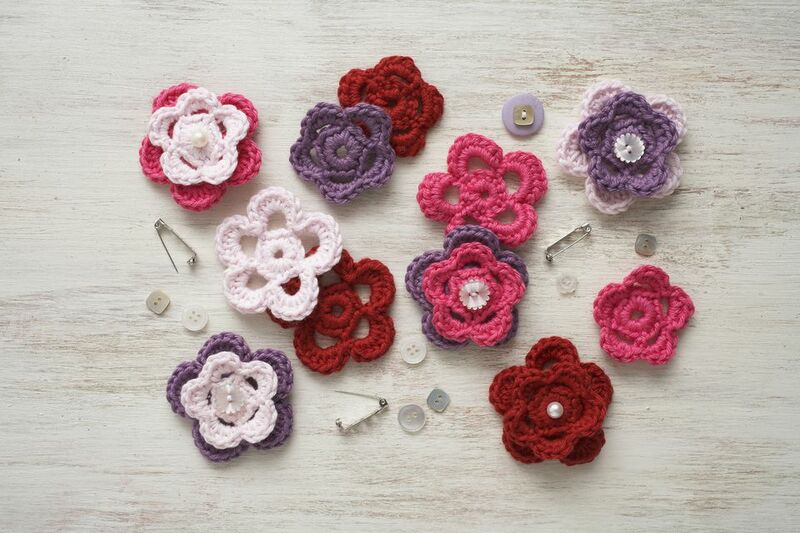 Use one (or several) on any item where you'd like to have a pretty crocheted applique. For example, you could sew a flower to your favorite sweatshirt. Use it to embellish a heart pouch or similar project. If you crochet the flower using fine crochet thread, you could use it as an accent on scrapbooking layouts or mini album pages. The thicker yarn version of this flower could also be used on mini album covers, where the dimension would not be a problem. (Be sure to use an adhesive that can handle the weight!) In my opinion, a flower made of yarn would be too bulky for most scrapbook pages.